What happens when you’re hired to do a job and you don’t perform as outlined in your contract? You get fired, that’s what. And that’s exactly what happened with Sikeston Area Humane Society. Sikeston Area Humane Society is an independent, non profit organization, licensed by the Missouri Department of Agriculture. For many years they have been contracted by the City of Sikeston to shelter, care for, and provide other services to the animals and people of Sikeston and surrounding communities. In return for the organization’s services, they are allowed to operate out of a city owned building, with utilities, upkeep, and operating expenses (in part) paid for by the City of Sikeston. Additionally, they operate in the capacity of a non profit, accepting tax deductible donations and collecting adoptions fees for revenue to fill the gaps that the city’s contract doesn’t cover. Even so, they are basically employees of the city and come June 19, Sikeston Area Humane Society is homeless and out of a job. Surprisingly, that announcement came late Thursday evening by way of a letter posted on Facebook by Sikeston leaders. 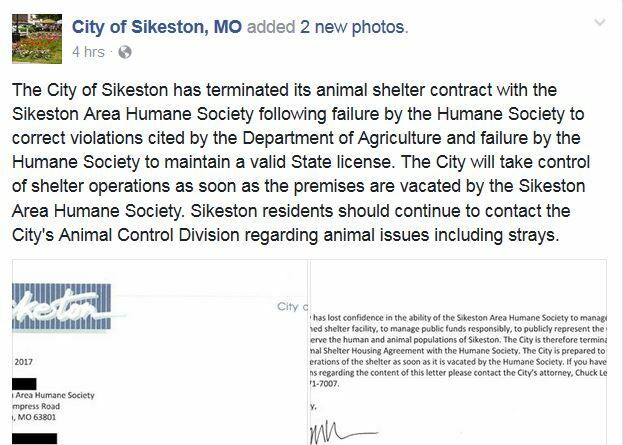 According to the letter, the decision to end the city’s contract with the organization came after it was discovered that Sikeston Area Humane Society has been operating without a license since April 20. The loss of licensing is reportedly due to failure to pay fines associated with violations found during the last three consecutive inspections by the Missouri Department of Agriculture. Also in the letter the city states that one of those violations is failure to report the disposition of animals to the state. Some 218 dogs were unaccounted for in the last report. Although the lack of licensing is grounds enough for the city to drop their contract with Sikeston Area Humane Society, the letter further states there were additional issues plaguing the organization. One of those issues has been continued poor customer service provided by shelter employees; a problem rumored about the organization now for months. The city does not feel that the organization’s behavior is in accordance with city policy, and that they have not acted in a manner befitting city standards. In closing, the city states that they are fully prepared to take over operations at the shelter as soon as Sikeston Area Humane Society has vacated the building. The contract termination is effective June 19, 2017. If the organization has not vacated the city owned shelter by the deadline, eviction proceedings will ensue. Worried about the well being of the animals already residing at the shelter, and whether or not the shelter would go back to being a high kill facility, people began commenting on the post regarding their concerns. You can click the images of the city’s letter below, for a larger view.